If you're not familiar with fishing you might think that all fishing is the same. There are actually several different types of fishing. Read on for more information about types of fishing. Fly-fishing is used to catch fish like trout and salmon, as well as pike, bass and carp. Artificial flies are used to catch fish. They are made from hair, fur or feathers. These are tied to a hook with thread. They are designed to imitate insects and other prey to fool the fish. The fly lines are usually plastic-coated, which gives them enough weight to reach the intended target. The artificial flies are in proportion to the line, rod and reel that is used - the heavier the fly, the larger the reel and rod. To angle effectively, the rod is held in the dominant hand (the one that you use to write), and the other hand is used to work the line out gradually to create momentum. To fish in cold waters, anglers wear waders (chest high boots), which allows them to wade out to a good distance. They also give good grip if you plan to try your hand at fishing on rocky riverbeds, which are often very slimy. The feet are made from neoprene, which will keep your feet warm and dry (this is vital if the water is especially cold! ), and offers padding to cushion you if you slip over. They are also less likely to perforate. Alternatively, some waders are made from Gore-Tex, which allows ventilation whilst you're wading through the water. However, they don't allow you to float very well if you slip or fall over in the water. If the water is particularly deep, an inflatable Personal Flotation Device (PFD) or Type III Kayak fishing vent offers additional safety. Freshwater fishing is used to catch fish like trout. It's a good activity for the whole family, so why not introduce your children to it? If you do take the kids along, it's probably best to fish from the shore or on a boat, rather than in an estuary or on rocks. As well as being safer, it gives them more options if they choose to take up fishing later in life. 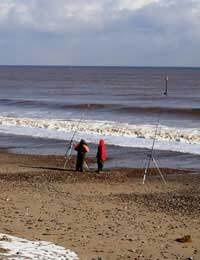 Sea angling is one of the more popular forms of fishing. The National Federation of Sea Anglers (NFSA) estimates that as many as one million people take part in sea angling in the UK every year. As the name suggests, a lot of sea angling takes place off a boat (into the sea), but it can also be done in estuaries, on piers and rocks. Most sea anglers do so for leisure purposes, but there is the option to take part in competitions and open matches. If you're really good, you can also compete at international level. The World Boat Championships are held every year, pitting the very best sea anglers from up to eighteen countries against one another. There are many more types of fishing than this, but these are three of the main types done in the UK. Whatever type of fishing that you choose, make sure that everyone wears a life jacket. If you've followed the clothing advice on our 'Fishing Clothing' article, you'll be too heavy to swim if you accidentally fall in, so this is essential.